An Essential Military Portable Folding Survival Shovel for Men Portable and compact, this ultra lightweight tactical shovel gives you everything you need in case of emergency. An essential tool to have for all drivers, it's the perfect gift for men that like to camp, hike and explore. Made to work either straight or at a 90-degree angle, this shovel comes with a folding steel handle and a tempered-steel blade with teeth. A comfortable rubber grip handle makes it easy to use, even for difficult projects when you need an entrenching shovel. Multi-functional, use this lightweight utility shovel for: •Digging •Sawing •Chopping •Cutting •Picking •Prying •Hammering •Bottle Opening •Shoveling •And more! Designed to be the ultimate survival tool, this portable shovel also comes with: •Extension Pipe •Fire Starter •Whistle •Life Hammer •Sawtooth Knife •Thickened Spade A compact shovel you can count on, this multitool is designed to last for decades. Click "Add to Cart" Now! THE BEST FOLDING MILITARY SHOVEL: A survival shovel you can count on, this military shovel is an essential tool to have on hand in your car, for camping, and more. Multi-functional makes it your go-to for emergencies and projects. MULTIPURPOSE SURVIVAL TOOL: Use this tactical shovel for digging, sawing, chopping, cutting, picking, prying, hammering, bottle opening, shoveling and more. Includes extension pipe, fire starter, whistle, life hammer, sawtooth knife and thickened spade. PORTABLE AND ULTRA LIGHTWEIGHT: Fold three times for ultimate portability. Study but lightweight, this compact shovel also includes a rubber grip handle for comfort. Have it with you to use when you need it! DURABLE STEEL MATERIAL LASTS: Designed with a folding steel handle and a tempered-steel blade with teeth, this survival shovel will last even with heavy or extreme use. Great for backcountry exploration, extreme camping, and as a gift for men and drivers. 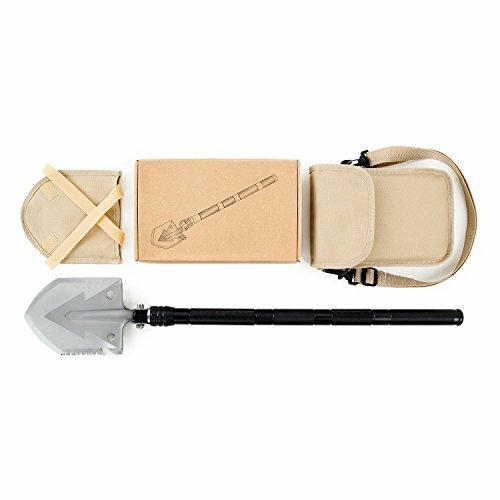 •100% SATISFACTION GUARANTEED: The best multifunction survival shovel, you can trust the quality of this fold up shovel. If you don't love it, we'll give you a full refund - no questions asked! If you have any questions about this product by Amistoly, contact us by completing and submitting the form below. If you are looking for a specif part number, please include it with your message.